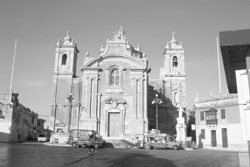 Information: Qrendi became a parish in 1618 and the people of the village immediately built a larger church, which later on was demolished and instead the present church was built between 1688 and 1713. Other information on churches under this parish: Church of Our Lady of Mercy The first church was built in the 13th century in the old village of Hal Lew which formed part of the parish of Zurrieq. The present church was built in 1650 and for a long period of time it was one of the most popular sanctuaries on the island. Every year a pilgrimage leaves Qrendi for the church just before its feast day on the Sunday after the 8th September. St. Matthew's Church This is an old church probably built in the 15th century on the edge of the Maqluba depression. It is open to the public on the Sunday after the 21st September, and for other spiritual needs. Marriages may be celebrated in this church. Chapel of St. Anne The church was built as a thanksgiving vow after the siege of 1565; it is open only on its feastday on the 26th July and for other spiritual needs. Chapel of the Saviour The chapel was built in 1658 on the site of an earlier church; today it is used for Prayer Meetings. Lately it has been restored and is now being used for adoration. Perpetual Adoration 8.30 am - 7.30 pm Chapel of St. Catherine The chapel was built in 1526; it is situated outside the village. Chapel of Our Lady of Divine Grace The chapel was built in 1658 overlooking the Maqluba depression; originally it was deicated to Our Lady of Victories.